Blythewood by Carol Goodman. Viking, 2013. Currently Available. Face Value: Solid cover, nothing amazing. It reflects the story, looks intriguing, but doesn’t do too much to grab your attention either. I really enjoyed this first book in a series, so I’m hoping it gets a more dynamic redesign in future editions. Does it Break the Slate? Totally. This is a great example of a supporting cast that is filled with Slatebreaking characters, building up a rich character landscape. Who would we give it to? If you love magical boarding schools (Harry Potter, and others) or if you love historical fiction focusing around the Triangle Shirtwaist Factory, this book has something for you! I am extremely fond of both of those things, so I was a likely target for this book. But it really works, not just as a retelling of familiar stories. Review: Avaline Hall’s life fell apart, starting with the man in the Inverness Cape. When she and her mother saw him, her mother started to take laudanum, eventually dying of an overdose. Ava went to work in a factory – of course it was the Triangle Shirtwaist Factory, so we know how that goes. Claiming she was rescued by a mysterious winged creature, she ends up locked in a mental hospital until she is rescued by the grandmother she had never known. Her grandmother sends her to Blythewood, the boarding school her mother had always spoken of with great happiness. 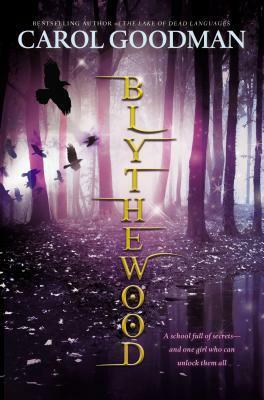 But at Blythewood, Ava learns the secrets of the school – and of her family, and finds herself caught up in a long-standing war between good and evil. I had mixed feelings when I read the description of this book. On the one hand, it combines a lot of different elements that I tend to really love in novels (historical fiction of this era, particularly centering around Triangle, a discovery of magic, boarding schools of any kind). But on the other hand, it seemed like that was a lot to throw together. The potential for greatness was there, but so was the potential for oversaturation. Luckily, Carol Goodman manages to infuse all of these elements into an original story with complex characters and engaging plot development. I liked Ava, and rooted for her, and the schoolmates she is surrounded with turn out to be engaging, multi-dimensional characters. The magic makes sense, and the world-building is effective. From a Slatebreaking point of view, I was particularly impressed that Goodman builds this world to be an imperfect one, and uses those imperfection to analyze class dynamics in interesting ways. Some of it I did find predictable, mostly the mystery pieces, but overall, I was enraptured by this new series. I can’t wait to read the next one. This entry was posted in Reviews, Young Adult and tagged Boarding School, Fantasy, Historical Fiction, Magic, Triangle Shirtwaist Factory. Bookmark the permalink.